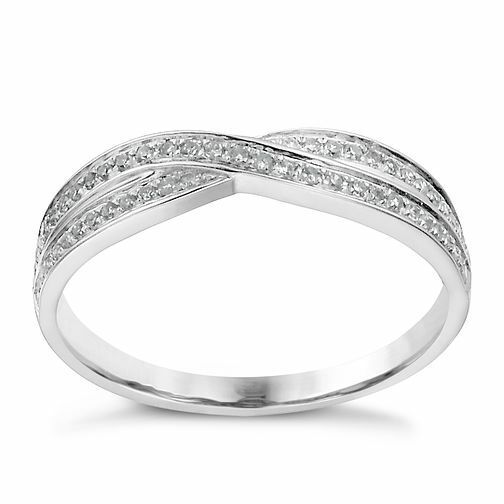 In precious 18ct white gold, this double band ring features a stylish crossover design. Delicately embellished with 15 points of glittering diamonds, this makes for a stunning eternity or anniversary ring. A classic combination of gold and diamonds. 18ct white gold 15 point diamond crossover ring is rated 1.0 out of 5 by 1. Rated 1 out of 5 by Anonymous from Very disappointed when it arrived in post. Looks cheap and unattractive. Very disappointed when it arrived in post. Looks cheap and unattractive.